This remarkable stereoview is looking lakeward from a spot in front of the Custom House, seen at the right. There are six tracks visible in this picture. The two nearest tracks in the neutral ground appear to be the tracks to and from the turntable terminal of the French Market and the Levee & Barracks lines of the New Orleans City RR. There is a horsecar on the right hand track, heading toward the turntable at Decatur Street, and just behind it (from our point of view) is another horsecar, barely visible on the next track, apparently just leaving the turntable. The next pair of tracks (moving from right to left) appear to be the tracks of the Crescent City RR leading to and from the terminal of the Tchoupitoulas line. There are three horsecars on the outbound track of this pair, on their way back to Tchoupitoulas Street (toward the camera) to begin their upbound run. At the far left, we see another horsecar, apparently on the riverbound track of the Canal & Claiborne RR. It is not certain whether this track is in the neutral ground or in the roadway, but see the caption of Picture 68 on this point. (It is even possible that this track is in the neutral ground and that there is another track in the far roadway, making a possible total of seven tracks in this block!) The track in the roadway at the right must be the lakebound track of the C&CRR. We can see a curve in this track at the far end, at Decatur Street; this must be an S curve, bringing this line onto the neutral ground after it passes the NOCRR turntable. 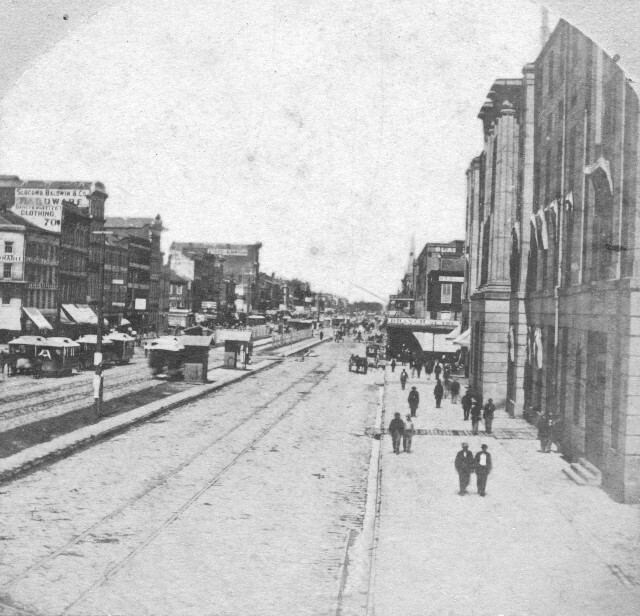 Apparently, there was no more room in this block of the neutral ground in 1869 when the C&CRR built its “Grand Trunk Route” from Claiborne to the foot of Canal at Wells Street, so these tracks had to be laid in the roadway. (However, there were six tracks in the neutral ground of the block of Canal between St. Charles/Royal and Carondelet/Bourbon. Why this block was not treated the same is unclear.) There appears to be a double line of young trees on the neutral ground in the next block, between Magazine/Decatur and Camp/Chartres. That would indicate that the Tchoupitoulas line turntable had not yet been moved from its original location at Canal and Magazine, an extension which took place in 1873. (See the caption of Picture 63.) Thus, this picture was probably taken between 1869 and 1873. Thanks to Morris Hill for much of this analysis of the picture.